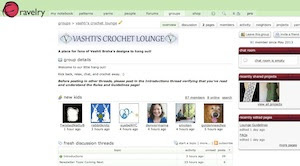 Vashti's Crochet Pattern Companion: Which Foundation Stitch? and Why? I researched 43 crochet stitch dictionaries and basic crochet how-to books to find out more about crochet foundation stitches (alternatives to starting a crochet project with a foundation chain). For a 2014 update, scroll to the end of this post. What follows is a photo tutorial for making each of them: the classic dch, the dark horse fslst, and the popular fsc. By doing it this way I hope to make it very clear how these three overlap yet differ in a few key ways. It's easy to confuse them as being the same thing. This actually keeps us from recognizing that we have more choices in how we start a new crochet project than we thought! The bottom/blue stitch is much newer than the dch and seems to be gaining widespread acceptance, especially on the internet. I found it in a smattering of books from 2005 to the present; it also appeared online in 1998, thanks to Mary Rhodes. This stitch is by now almost always called "Foundation Single Crochet" and abbreviated "fsc." The ultimate source on it is Marty Miller's article, "Get in the Loop: Foundation Stitches" in the Spring 2007 issue of Interweave Crochet magazine. The green stitch in the center is my personal favorite of these three choices. I'm not the first to use it, but this exact stitch does not appear in any of the books I have. It simply combines what I think is the best of the dch and the fsc. I wrestled with what to name it. "Foundation slip stitch" (fslst) has its pros & cons as do all other names I considered, such as "alt fsc" and "extended slst." I'm going with fslst because in a "family" of foundation stitches like the fsc (and taller versions such as fdc, ftr, and so on), it's a logical name for a slimmer option. Sometimes the fsc is a bit too beefy to substitute for a plain foundation chain. As you can see in the top photo, the fslst is the slimmest of the three. 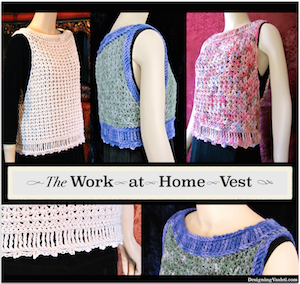 It is without a doubt the one perfect foundation for my Work@Home Vest neckline. Here are the instructions to go with each step-by-step photo. To begin the dch, the fslst, and the fsc, chain 2. 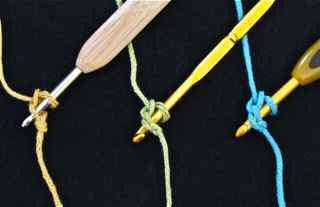 For dch (left/yellow): insert hook in ONE top loop of 2nd ch from hook. For fslst (center/green): insert hook in TWO loops of 2nd ch from hook. 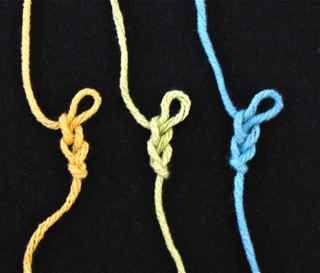 For fsc (far right/blue): insert hook in TWO loops of 2nd ch from hook. Yarn over hook and pull up a loop: 2 loops on hook. For dch: Yarn over and pull through both loops on hook: first dch stitch made. For fslst: Yarn over and pull through both loops on hook: first fslst stitch made. For fsc: Yarn over and pull through ONE loop on hook: 2 loops remain on hook. This chain stitch forms the base, or foundation, of a single crochet (sc) that will be created next. For crocheters new to the fsc, it helps to pinch this chain just made. Now yarn over and pull through both loops on hook: sc made. To make the next dch: insert hook under the ONE strand along the left side (if you're crocheting right handed) of dch just made, yarn over and pull up a loop. To make the next fslst: insert hook under the TWO strands along the left side (if you're crocheting right handed) of fslst just made, yarn over and pull up a loop. To make the next fsc: insert hook under TWO strands of the base chain (that you are hopefully pinching with your fingers) of fsc just made, yarn over and pull up a loop. To complete the dch: Yarn over and pull through BOTH loops on hook. Avoid "yanking" it tight. Repeat Steps 5 and 6 for desired number of foundation stitches. 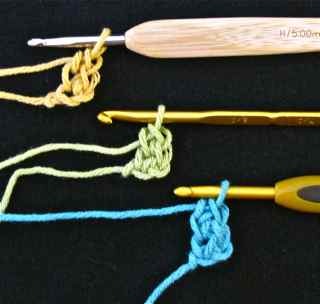 To complete the fslst: Yarn over and pull through BOTH loops on hook. Avoid "yanking" it tight. Repeat Steps 5 and 6 for desired number of foundation stitches. To complete the fsc: Yarn over and pull through ONE loop on hook. Avoid "yanking" it tight. (Pinch this stitch to mark it for yourself that it's where you'll start the next fsc.) Yarn over and pull through both loops on hook to complete the fsc. Repeat Steps 5 and 6 for desired number of foundation stitches. For Tunisian crochet foundation stitches—and why they're awesome—I blogged a how-to here. 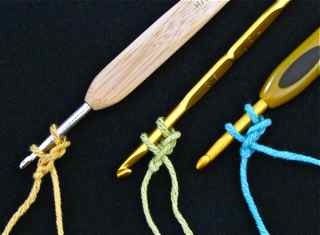 If you want to learn more about foundation crochet stitches, see my post about Marty Miller's new online crochet class. 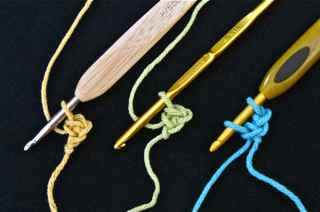 Great class for all crochet skill levels! Ooh, very interesting! Will try! Fantastic newsletter/blog post this week. This ex-librarian would love to know what books you researched. Ros: I'm working on creating an online space where I have a list of the particulars of each book (my bibliography), and then for each topic I research, I can easily refer to the sources (faster, easy-on-the-eyes footnoting). Sort of like putting my crochet library holdings online, and then being able to cite them with hotlinks. Vashti, thank you so much for posting this tutorial!!! I've been using fsc for most of my project now, but not always 100% happy with the way it looks. I think fslst will solve all of those problems!!!! I think I wound my new favorite stitch. Thanks so much for this, it's all very interesting. I have never heard of "double chain" but I really want to try it, and your fslst method looks good, too. Good to have different options for different projects. thanks so much for this tutorial! i found it on pinterest and had been about to seek out a tutorial last week. awesome to have the three options side-by-side. i tried the blue on first, because i liked its bulk. but it didn't come as easy as the green one. so, i've got one down and will come back to practice the other later. p.s. and it's also nice to think there's still more to discover re: crochet! Thankyou for the super clear instructions. 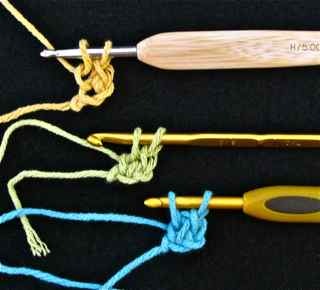 I am always looking to learn new crochet tips and techniques...great! You're so welcome, glad to help fellow crocheters! Thanks for commenting. Thanks for sharing the instructions, I love it! Marty's excellent article has now been reprinted in Best of Interweave Crochet, making it pretty easy to access. Hi CaraLouise, thanks for your comments, they make my day! Just found you. Thanks for showing how to do the foundation stitches. I have tried all kinds of sites and can't seem to get it. I think I finally got it through my thick brain. I think???????? Thanks so much for putting these foundation stitches together. I will be trying them soon. Your time and efforts are very much appreciated. You're very welcome, I'm glad it's useful! Thanks for this. One of my crochet customers was asking for help with this and your page was the clearest for her. Hello Vashti, thank you very much also from germany. I read a lot about foundatin stitches, but never really get the way they´re done. I didn´t search for a tutorial, but now on pinterest your´s jumped on me. So here I am and it absolutely works fine. You're welcome, Nina. Thanks for your comment. Thanks for this, it's very helpful. It looks like foundation single crochet is the most difficult, since one is liable to get confused. Which explains why I'd given up on it. But now you've shown us these alternatives, I can try again! Did you ever experience a situation where the light bulb comes over the head and everything falls into place? Finally, this makes sense, looks great and I thank you! Thanks so much for comparing the 3. I have used the fsc, but had a pattern that called for a dch. I have searched all over the place for how to do it correctly, but most mistake a fsc for a dch. The pattern I am doing explained it 100% wrong!! Thank you for helping my little brain!! !